Join us to observe the science of kindness: if you are kind to one person, they will be kind to four other people, and each of those four people will be kind to four more people, and so on and so on… eventually circling back around to you again. 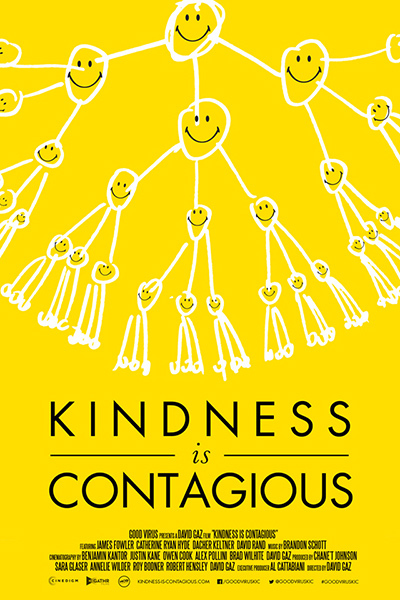 “Kindness is Contagious” profiles cutting-edge scientists and best-selling authors from Berkeley and Harvard, as well as CEOs, roller girls, artists, soup kitchen volunteers, police officers, models and many others to show you the impact of kindness and generosity. Learn how a little generosity can help us live happier, healthier, wealthier, longer and more fulfilling lives. Free; open to UCB students only (UCB student ID required). Movies @ Moffitt happens on the first Wednesday of each month of the semester.